The U.S. Ambassador to the United Nations, Nikki Haley. 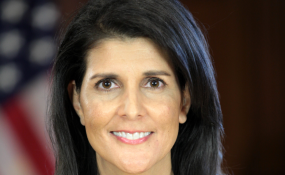 Ambassador Nikki Haley, U.S. Permanent Representative to the United Nations, delivered remarks this afternoon at the Heritage Foundation in Washington, D.C., on the U.S. withdrawal from the UN Human Rights Council and the importance of continued U.S. leadership on human rights around the world.